What do you do when you have the kids home from school for spring break, a bag full of candy and Easter only a week away? Make some Easter Crafts for Kids! We recently had some time on our hands so with the help of my daughter Aubrey we created some fun jelly bean bracelets. First thing you want to do is measure to see how much floss you will need to go around the wrist of the person who will be wearing the bracelet. Next decide what color you want the bracelet to be. We decided we wanted all of the colors of the jelly beans, except the black ones because these are my FAVORITE! 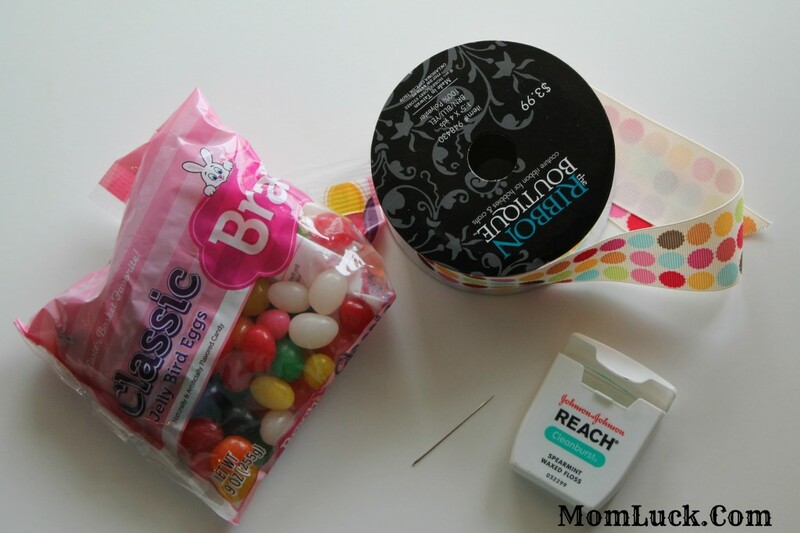 Thread your needle with the dental floss just like you would with thread. 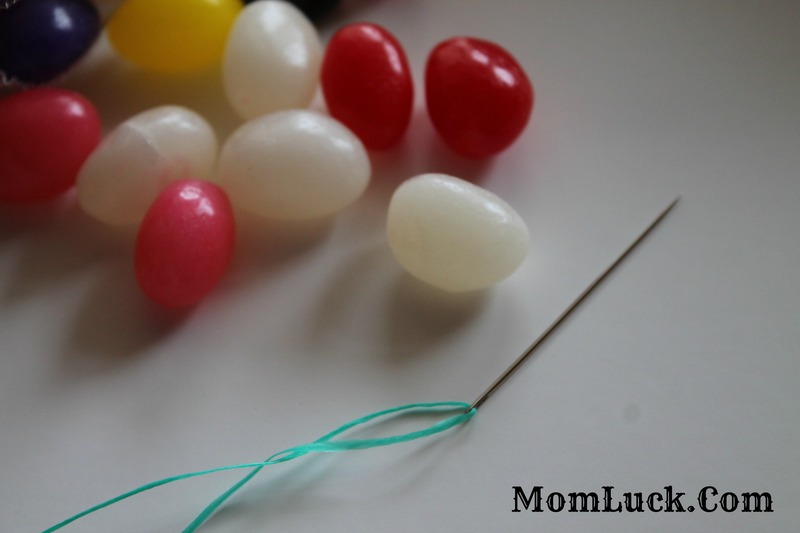 Take the needle and push it through the side of the jelly bean. Continue threading the jelly beans through until your bracelet has jelly beans all the way around. 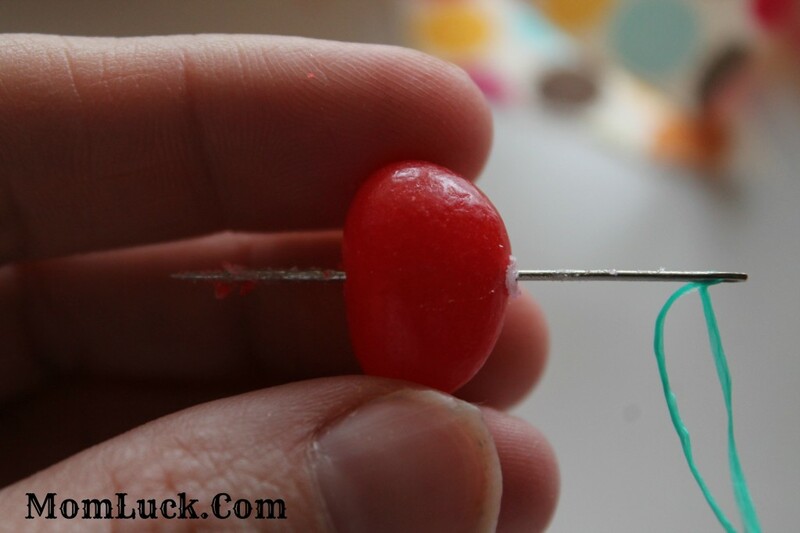 Be sure to leave a little bit of floss so that you can tie it together and add the ribbon. After you tie the bracelet together add a small ribbon to cover the dental floss. That’s it! 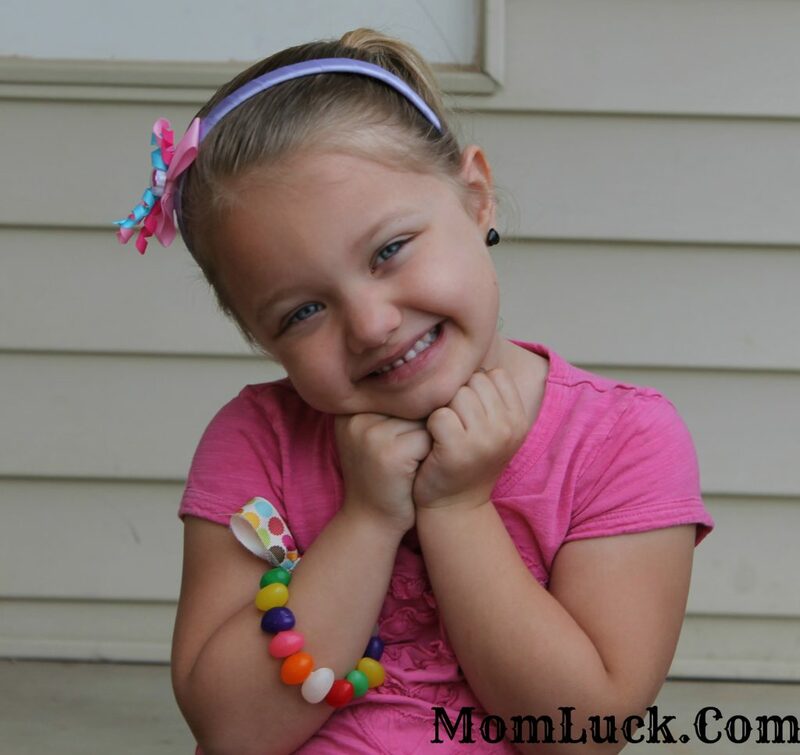 Aubrey managed to wear her bracelet for a few minutes and then started to eat the jelly beans. That’s ok though because eating the bracelet is half the fun. We are planning on making a few more over the next week and maybe even a necklace. 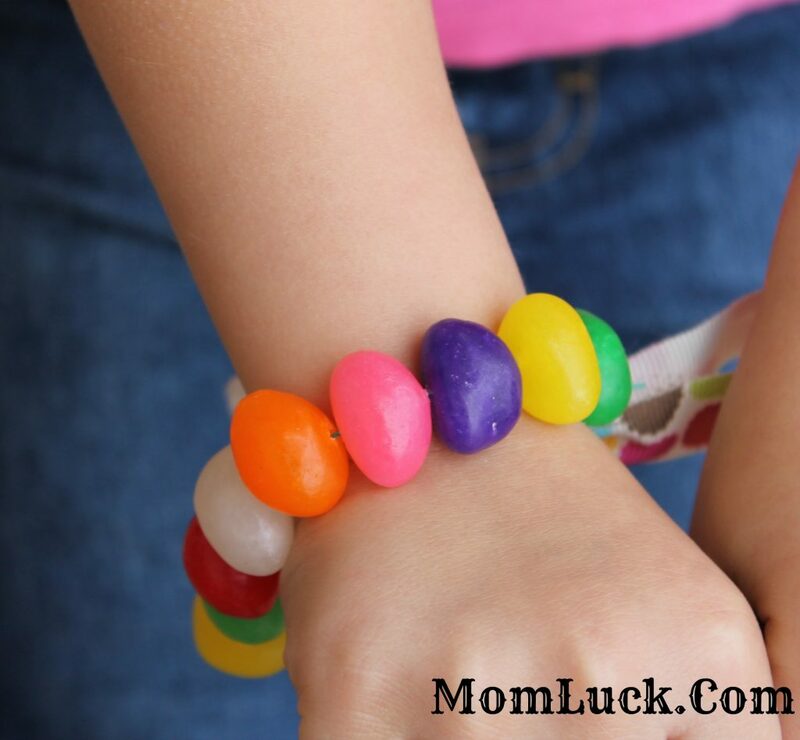 Making Easter Crafts For Kids like these jelly bean bracelets is a fun memory for both you and your child. They are super easy and quick. If you are looking for more fun Easter crafts check out my recipe for Marbled Easter Eggs. What’s your favorite flavor of Jelly Beans? oh my gosh too cute! I might make one for Easter! That bracelet is too cute! And, thanks for the tutorial! Awww. Such a cute idea. That is so cute! Aubrey looks like she loves it! What a super cute idea. How cute an perfect for Easter. You know, I have boys, but I guarantee they would both love one of these. How cool and what a creative idea. Very impressive!! That’s a super cute bracelet and looks very festive for Easter. This is so cute! I’ll have to try this! That is so cute. I think the kids and I will make those this week. It’s our spring break. 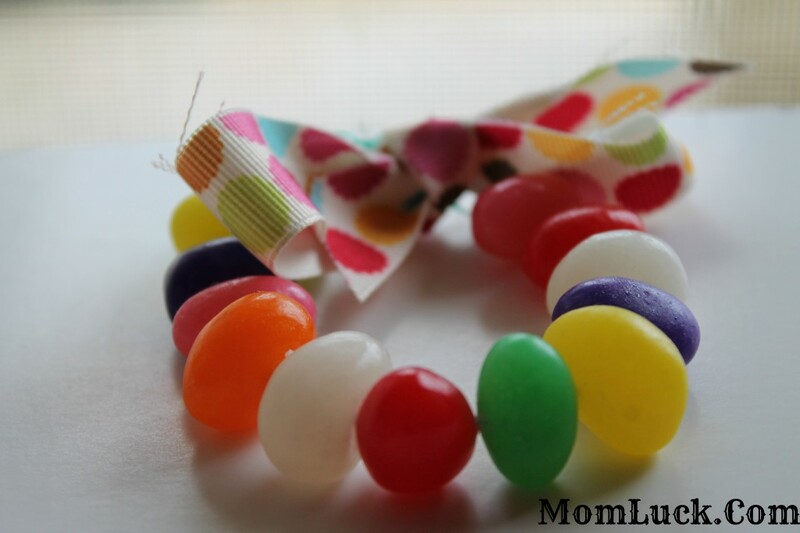 How cute and much more tasty than the traditional candy bracelets. What a cute idea! And O.M.G. she is so adorable! What a great idea! Do the Jelly Beans get sticky on the skin? I think this would be great to do in conjunction on Easter with the Jelly Bean prayer too! We didn’t have any problems with them sticking to the skin but it’s been cold here lately. I’m not sure how they would hold up in the heat. These would be super cute with the Jelly Bean prayer! This is so stinkin cute! The girls and I will be making some of these. Thanks! Thanks!! My daughter had a blast making (and eating) her bracelet. What a fun fun idea! These are moments I wish I had a little girl. So cute and great idea!